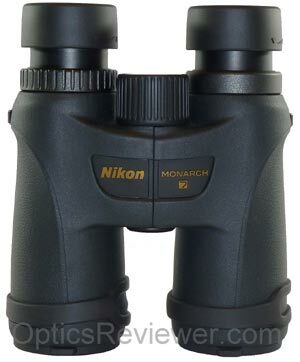 Nikon Monarch 7 Binocular: Nikon Competes on Value! 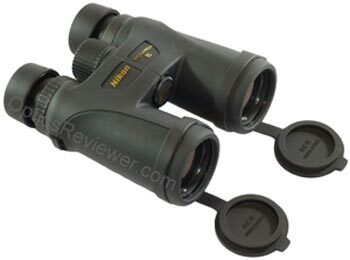 Nikon Monarch 7 Binocular: Nikon's Value for Price Competition! The Nikon Monarch 7 we ordered arrived and, after opening the box and getting some pictures of it, we took it out with another binocular to see how it performed. First impressions were that the binocular market is in for a shakeup with pricing adjustments. This binocular presents an above average value for the price and shows that Nikon is competing aggressively on price in response to market pressures. Why is that? "I have been doing quite a bit of research for my next binoculars (likely the Nikon Monarch 5/7) over the past month or so. I had been searching the various Optical forums which was somewhat helpful, but in some ways left me more confused than when I started. I also found other reviews online, but so many were rather outdated. I recently came across your site. Great site! Very helpful. In particular, I found the direct comparisons between similar models to be helpful. Your articles make it very clear what each model's strengths and weaknesses are. I offer a big thanks to the OpticsReviewer team!" "I will be back soon and often." We'll talk more about some of the mechanical and optical elements in a bit, but first a couple of things quickly caught our attention. We took the Nikon Monarch 7 out late in the day and were quickly taken in by its wide field of view. We've long said that you can't see what you don't know about. A wide field of view lets you know about more of the action and makes it much easier to acquire a view when you bring the binocular up to your eyes. Certainly, including Extra-low Dispersion (ED) glass in its lenses helps with resolution regardless of the level of light — we watched to see what effect it might have in low light. 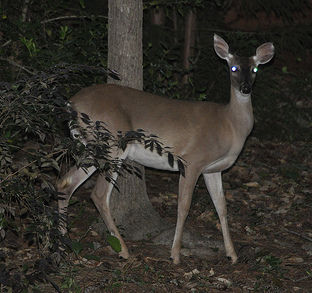 As the daylight faded and twilight quietly enfolded us, it found us in a place where we've often seen whitetail deer come out in the evening. We waited expectantly to see what wildlife this particular evening would produce. We kept panning back and forth across the edge of the woods to see what might initially come into view. Slowly at first, we saw a doe and two spotted fawns appear high upon a hill. A couple of more deer appeared to the left and then four more lower and to the right came into view. Something happened to frighten them into retreat and we settled in for a bit of a wait. Interestingly enough, off to our left (where we've not often seen them previously), a group of six deer edged out into an open field — including two bucks with velvet antlers. Switching our view back to where those intrepid first few came into view, we noticed some of the recently frightened ones coming back into view off to the right. Far, far to our left, where we don't normally look for deer, we then saw five deer, a couple of them bearing velvet antlers, grazing in an open field. What made all this particularly interesting was that with the Nikon Monarch 7 binocular, we were able to see the deer better in low light than with many other binoculars. It was so much fun watching the wildlife; we just stayed there until it was dark. We wanted to be able to give you a decent idea of what we saw, but the camera we had along didn't do justice. It was a satisfying evening. Enough of the reminiscing, then, and we'll get on with this review! The Nikon Monarch 7 is nicely balanced with a durable feel. This binocular is truly comfortable to hold and use. What about the weight? 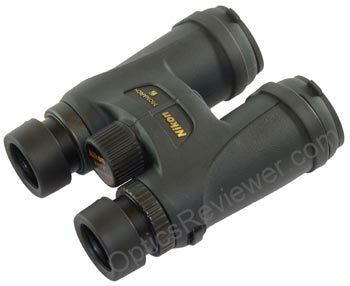 It is a very lightweight contender in the full-size binocular field. The chassis for this binocular is made of polycarbonate with fiberglass reinforcement according to our friend who works at Nikon. It makes this perhaps one of the lightest 42mm binoculars without yielding quality in its construction or optics at this price point. The ergonomics of the Nikon Monarch 7 are very good and make it easy to hold it steady. The picture of the bottom of the barrels shows that there aren't thumb indents as such, but that there is a gentle tapering in the rubber armoring with a swell just below the neck strap tabs. The swell in the barrel occurs where our thumbs naturally and comfortably grip the barrel for good balance. Nice! When we have a good binocular, such as this one, we like to be able to use it with either a tripod (using an optional tripod adapter) or with a window mount to use it in an automobile. 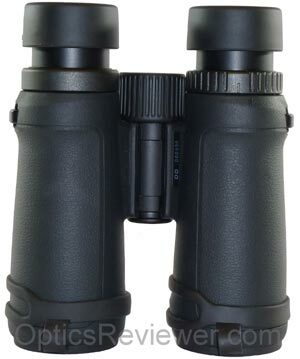 This binocular, as do most at its price point, has a standard threaded receiver for such use. We feel as though making use of something like this significantly expands the usefulness of any good binocular. It takes away the natural, minor movements that can disrupt being able to discern the fine details of a view and allows us to take advantage of a binocular's full capabilities. As one would expect for a roof prism binocular at this price point, the Nikon Monarch 7 is both waterproof and fog-proof. The points where moisture would creep in are sealed with O-rings and lubricants that are effective across a range of temperatures. This makes it possible to use these binoculars in areas of high humidity without undue worries about the optical coatings inside being eaten by fungus. It also seals out dust and grit! The eyecups are of the twist-up&sol;twist-down variety. They have two intermediate positions with good detents to hold them in place between un-extended and fully-extended. They have a relatively firm rubber covering which feels comfortable against the skin and which helps to hold the rain guard in place. For those who may have experience with the eyecups on the older Monarch binoculars, these are an improvement. The amount of eye relief provided by the Nikon Monarch 7 is quite good for eyeglass wearers and we doubt that most will be disappointed in this area. The 17.1mm eye relief with the 8X42 configuration we bought was easy to adjust the eyecups for using without glasses as well as adjusting for use without. You'll turn the focus wheel nearly 1.5 clockwise revolutions to change from the close focus setting to infinity. It is very nice to focus — silky smooth and impressively so. None of us had any complaints about the feel of the focus mechanism. We accept 1.5 revolutions of the focus wheel as the outer limits of the focus adjustment. We prefer a single revolution, but people have pointed out (and they're right) that 1.5 revolutions allows for a more precise fine focus adjustment. It's a matter of preference and we're able to be quite happy with 1.5 revolutions of the focus wheel when the rest of the optics are good, as they are with the Nikon Monarch 7 binocular. We suspect that Nikon has invested in a manufacturing operation in China, as have a number of other optical manufacturers. By doing this, and effectively becoming part owners in the operation, they would have quite a bit of say in what quality controls and standards are in place. The Nikon Monarch 7 binocular we purchased has "Made in China" stamped on the bottom of the hinge near the serial number. If memory serves us well, Nikon has been manufacturing optics in China for a while now. They apparently have good controls over production quality, since we don't hear much at all about variations in quality from one unit to the next. In fact, to our way of thinking, Nikon probably exerts as much or more quality control over their manufacturing operations in China as any other optics company with production facilities in China. That's not to say it's perfect, but that it's very good. The design team must have been listening to the growing number of binocular users who prefer a wide field of view. The angular field of view for our 8X42 Nikon Monarch 7 is a full 8°. That gives an apparent field of view of 419.2ft at 1,000yds (127.8m at 1,000m). The angular field of view is quite good for the 10X42 configuration, as well, at 6.7°. Those are terrific fields of view and we're frankly delighted that Nikon is providing them! When you compare them with a more average field of view, they're anywhere from 70 to 100ft (21 to 30m) more and that's noticeable when you're trying to keep an activity in view! We were delighted with the depth of view we saw in our Monarch 7. The greater the depth of view, the less focusing you have to do as you change the distance over which you're viewing something. A Porro prism has the depth of view that makes it seem you're viewing a three-dimensional image. At higher price points, manufacturers are able to recover the cost of working greater depth of view into a binocular's optics. We frankly like this because it tends to mitigate the 1.5 revolutions of the focus wheel to go from the close focus setting to infinity! What about the center of the field of view where the resolution of details is usually the greatest? The area typically referred to as the optical "sweet spot"? When we tested the 8X42 Nikon Monarch 7 which we had purchased, we found that by looking very closely we could discern a slight softening of the details at about 43&percnt; of the field of view's radius out from the center. At about 71&percnt; of the radius out from the center, we noticed that details started to blur and become noticeably fuzzy. We fell that it's a good "sweet spot" — especially given the wider than average field of view provided by the Monarch 7. We found the ED glass used in this binocular made a difference in the resolution of color details by preventing the blurring of the line between colors. When you first move from a binocular without ED glass to one with it, the difference may not register as a striking one. After having used a binocular with ED glass for a while, however, we find the difference noticeable when we pick up a binocular with "regular" glass. Chromatic aberration, while not entirely a thing of the past with the introduction of ED glass, seems significantly reduced in the unit we bought. While we found that it was still possible to induce chromatic aberration if we tried hard enough, it wasn't something that was evident all the time we were using the binocular. In binoculars using the roof prism design, light transmission is affected by the type of reflective prism coating used as well as other factors. A significant factor in the cases where dielectric prism coatings are used is the number of coatings applied to the prisms. Twenty or 40 dielectric coating layers on a roof prism will result in a significantly brighter image than only 2 or 5 layers. While we don't know the number of dielectric layers Nikon applies to the prisms at various price points, we feel safe in saying that this binocular has an above average number. Combine the number of dielectric layers on Nikon Monarch 7 binocular prisms with the fact that Nikon applies them in a gas chamber, which assists them in reaching the smaller corners of the prisms, and it's understandable that the Monarch 7 would be a good performer in low light. Of course, you would expect the prisms to be made of BaK-4 optical glass at this price point as well as to have phase correction coating and you'd be right. These binoculars are made that way. With this binocular we don't watch wildlife until twilight; we watch it through twilight with clean, clear, crisp images. We expect that the ED glass used in the objective lenses improves the resolution of details in both normal daylight and in low light conditions. Also, the exit pupil of 5.3mm for our 8X42 certainly does nothing to harm the brightness of the view. How does the Nikon Monarch 7 Perform with Strong Light? When we used our Monarch 7 beside a lake or pond to see what effect reflected sunlight might have, we found that it dealt with the strong light by only giving a minimal amount of glare. We wondered how it would perform at night when we viewed a strong light source, such as parking lot lights. We found that our unit had a minimal amount of spiking out from the light source. While the company specifications for the Nikon Monarch 7 indicate a close focus of 8.1ft (2.5m), we found our unit's close focus to be just 6.3ft (1.9m). This is certainly an advantage for many birders and it isn't bad for others who want to get the details of something that's not far away, but out of reach for other means of observation. We rather enjoy a good close focus for the insects that either don't allow us a close view or for those which we're hesitant to approach at close distance. How does the Diopter Setting Adjust? The diopter adjustment is a ring on the right barrel, just below the eyecup. Those who know us will recall that we like a locking diopter adjustment. It's simply that it prevents having to re-set the diopter as frequently as one might have to otherwise. While the Nikon Monarch 7's adjusting ring doesn't lock, it is designed to move very stiffly. In our opinion, this reduces the risk of a "self-adjusting" diopter to an acceptable level. If you're at all like the folks here, you're all anxious to see what came in the package when it arrives! We like the part of opening the box and seeing just what's inside! The carrying case that comes with the Nikon Monarch 7 is made of a durable-feeling, woven synthetic fabric — either nylon or perhaps polyester. It has a soft synthetic lining with a soft padding for the binocular. The case's flap closure is held closed with a Velcro fastener. The carrying case does not have a separate neck or shoulder strap. When you take the binocular out of its case, there is a belt loop sewn on the back that you can use. We suspect the belt loop isn't strong enough to hold the weight of the binocular, though. A two-inch neoprene neck strap comes with the Monarch 7, too. The neoprene part is about 14in (35.6cm) long so it actually fits around the neck and rests on the shoulders easily. It's quite comfortable and, due to the relatively short neoprene element, can be adjusted to a relatively short length according to your preference. Are Rain Guard and Lens Covers Provided? The rain guard for our binocular was made of a stiff-ish black plastic with a relatively smooth surface. The caps that set down over the oculars were deep enough that they were not flipping off continually. The friction of the rubber eyecup coverings helped with keeping the rain guard in place, too. Overall, we like the rain guard and found it to be an improvement over the rain guard supplied with the older Monarch ATB binoculars. 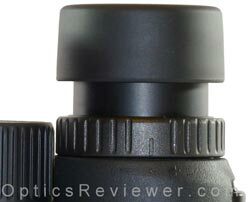 The caps for the objective lenses were of a very nice rubber and were designed to have a ridged element fit into a groove inside the end of the barrel. It is no doubt a very sound design in concept. In practice, however, it seemed to have a number of problems. The bottom line was that we weren't able to find a way to keep the caps from unpredictably falling free of the lenses they were supposed to be protecting. Once we realized that, we took them off and left them in the box so they wouldn't be in the way and wouldn't be lost. We also found a user's manual and warranty registration card in the box. 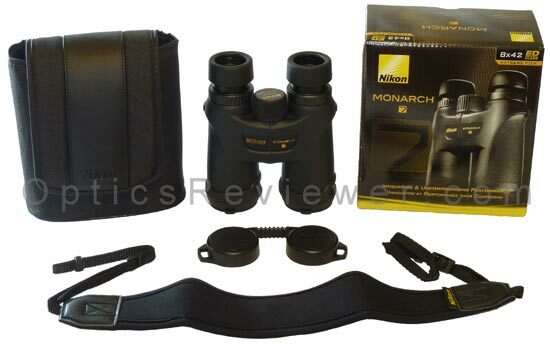 We love our Nikon Monarch 7 binocular! We love the wide field of view that makes using it a delight in both knowing what's going on at a distance and in acquiring a view as we raise the binocular to our eyes. This will make plane spotting easy, for example. It's also makes life easy for just about anyone using a binocular, especially birders, astronomers, sports fans, race enthusiasts, hunters, anyone needing to conduct surveillance, and we could go on for a long, long list. The light weight seems likely to particularly appeal to hikers, for example. The aggressive competition in both features and pricing that Nikon has mounted with the Monarch 7 are to the consumer's advantage. This binocular is an excellent value. For prices and customer service that can't be beat, these links take you directly to the Monarch 7 selections at Amazon.com or Amazon.co.uk . Because we were just as curious as anyone else, we've also compared the Nikon Monarch 7 binoculars with the Bushnell Elite ED and Vortex Viper HD binoculars. We're happy to share our thoughts through our comparison of Monarch 7, Elite ED and Viper HD article. Nikon's 25 Year Limited Plus No-fault Warranties for their binoculars are excellent. They cover the Monarch 7 during the time that you would reasonably expect it to be in its prime and functioning well. If your binocular requires a service or repair not covered under the limited warranty, you'll want to slip $10 in with it and you'll be responsible for return shipping and handling. They're covered even if the problem was your own fault.